Just before the Senate on Thursday voted to confirm John Brennan to head the CIA, his nomination had to overcome one last obstacle – a filibuster of nearly 13 hours led by Sen. Rand Paul, the Kentucky Republican. Paul had taken the floor amid concerns aired by some on both sides of the aisle about the administration’s use of unmanned drones in targeting terrorists, and whether they might ever be used in such a way in the U.S. In general, the drone strikes against terrorists abroad are supported by a majority of Americans but they draw widespread opposition in most other countries surveyed. In a Pew Research Center survey conducted Feb. 7-10, 56% of Americans said they approved of the U.S. conducting missile strikes from drones “to target extremists in countries such as Pakistan, Yemen and Somalia.” About a quarter (26%) of the public disapproved. However, as some in Congress press the White House to be more transparent about the drone program — just as senators did during Brennan’s confirmation hearings on Feb. 7 — 31% of those surveyed said they were very concerned about whether the drone strikes were being conducted legally. 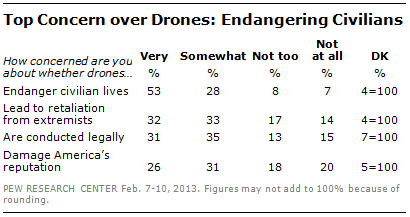 Among those who disapprove of U.S. drone strikes, the number of those very concerned about their legality was 52%. Questions about the legality of the drone strikes arose after the 2011 drone killing of Muslim cleric Anwar al-Awaki, a leader of al Qaeda in the Arabian Peninsula, an American citizen born and raised in the U.S. The White House has since made public its legal justification for targeting of an American citizen who posed “an imminent threat of violent attack” against the U.S.
Paul, as well as Sen. Ron Wyden, an Oregon Democrat, have pressed further, asking about the potential for targeting an American citizen on U.S. soil. Attorney General Eric Holder said in a March 4 letter that such an action would be “hypothetical, unlikely to occur” but might happen in an “extraordinary circumstance” after an attack on the scale of Pearl Harbor or 9/11. Pew Research has not polled on the question of use of drones against an American target on U.S. soil, either in foreign countries or in the United States. But a Fox News poll conducted Feb. 25-27, found that 50% opposed using drones to kill a suspected terrorist who is a U.S. citizen on U.S. soil while 45% approved. Asked if the president, “on his own,” should be able to authorize such a strike against a U.S. citizen on U.S. soil, 63% answered no while 32% said he should be able to do so. The Fox News poll also found that a majority (74%) approved of using drones to kill a suspected terrorist in a foreign country and 60% approved of using drones to kill a suspected terrorist in a foreign country “if the suspect is a U.S. citizen.” And 56% approved of the use of drones to kill a suspected foreign terrorist in this country. A Washington Post/ABC News poll, conducted Feb. 1-4, 2012, found that 83% of Americans supported the use of the drone strikes overseas, and among those supporters, 79% also approved their use against American citizens in other countries if they were identified as suspected terrorists. Aside from the legality issue, the Pew Research survey in February found that 53% said they were very concerned about whether drone strikes put the lives of civilians in danger. Even among those who approve of the program, 42% said they were very concerned the attacks risk lives of innocent civilians. Among those who disapproved of U.S. drone attacks, nearly eight-in-ten (79%) are very concerned about possible civilian casualties. Other possible consequences from drone attacks spurred less public concern: 32% were very concerned they could lead to retaliation from extremist groups, and 26% worried they could damage America’s reputation around the world. 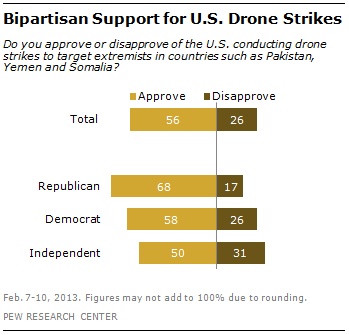 The support of the U.S. public for general use of drone strikes against suspected terrorists abroad stands in stark contrast to world opinion. Last spring, the Pew Research Center surveyed publics in 20 countries around the world, including the U.S., and found that in 17 of them, more than half disapproved of the U.S. conducting drone strikes to target extremists in places such as Pakistan, Yemen and Somalia. The use of the drone strikes was particularly unpopular in majority Muslim nations, but it also faced disapproval in Europe and other regions as well. Disapproval was strongest in Greece (90%), Egypt (89%), Jordan (85%), Turkey (81%), Spain (76%), Brazil (76%) and Japan (75%).